There are so many great places to visit in Japan that it’s hard to see them all in one go. 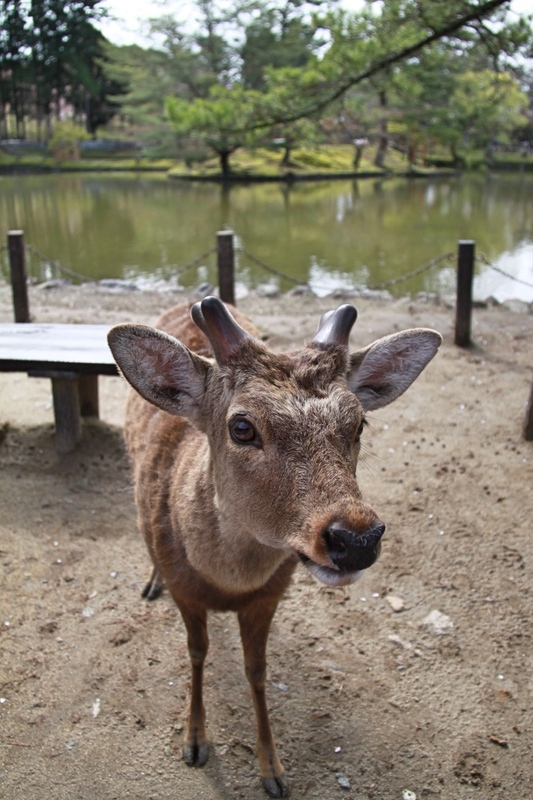 But if you’re visiting either Kyoto or Osaka, a great side trip is to the city of Nara. Nara is less than an hour away by train from either of those places and is a beautiful place to visit. 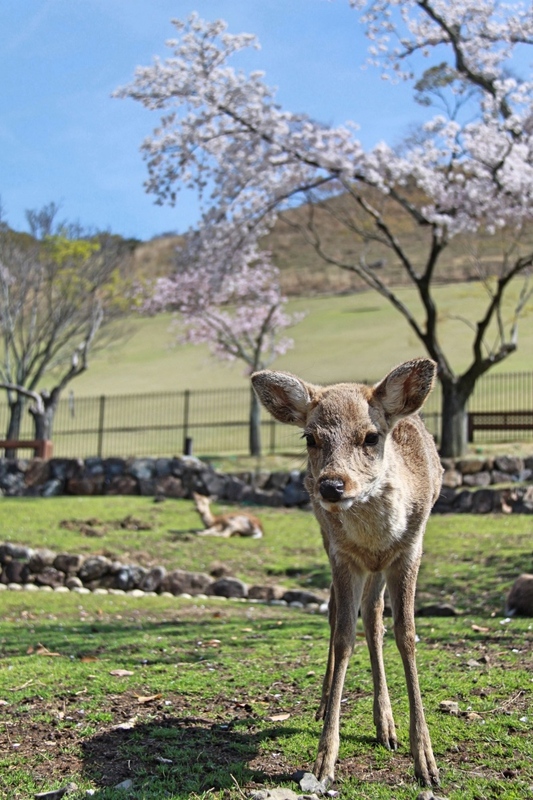 You may have heard of Nara before; two things make it very popular, the wild deer and the big buddha. As an animal lover, I was looking forward to meeting the friendly furry locals! But there is much more to do in Nara than that. 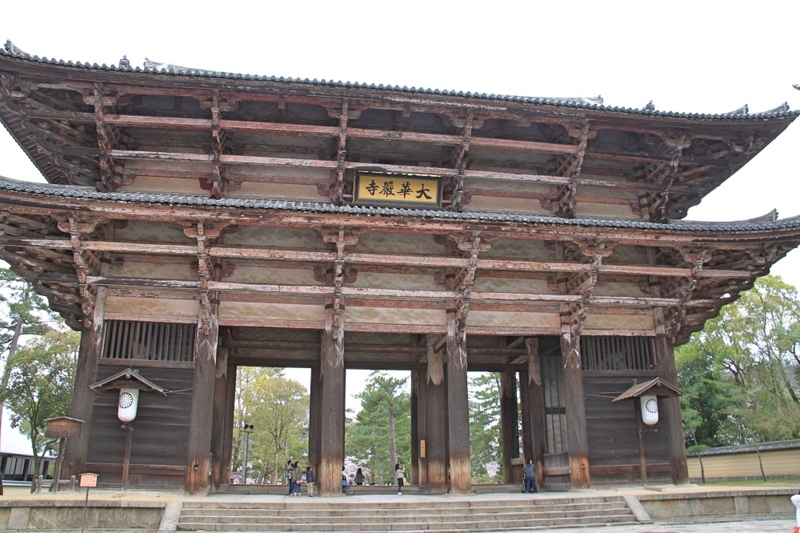 As Nara was the first permanent capital of Japan from (AD 710 to 794), it is full of historic buildings and temples. The main gate to Todai-ji temple (Nandai-Mon). 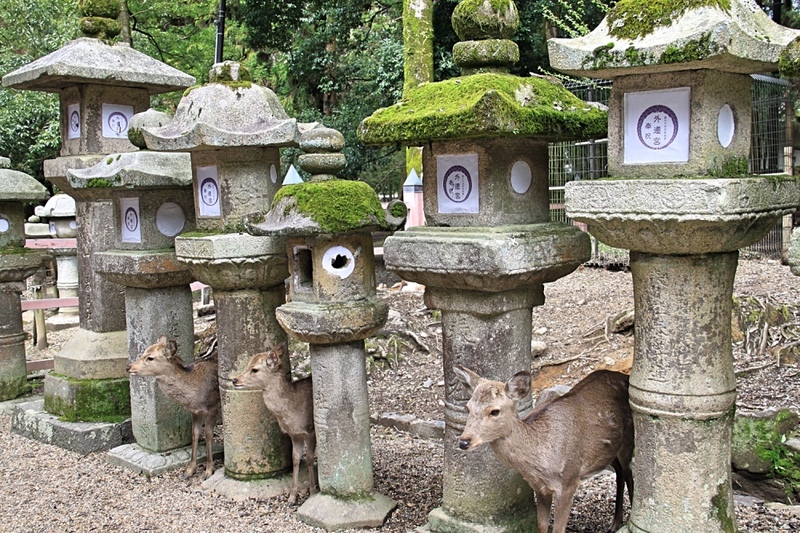 The deer are the stars of Nara and you can see them everywhere. When I say everywhere, I really mean everywhere, crossing the busy streets, lying in front of store-fronts, lazing in the park; they are in every corner! Hanging out by the vending machines! 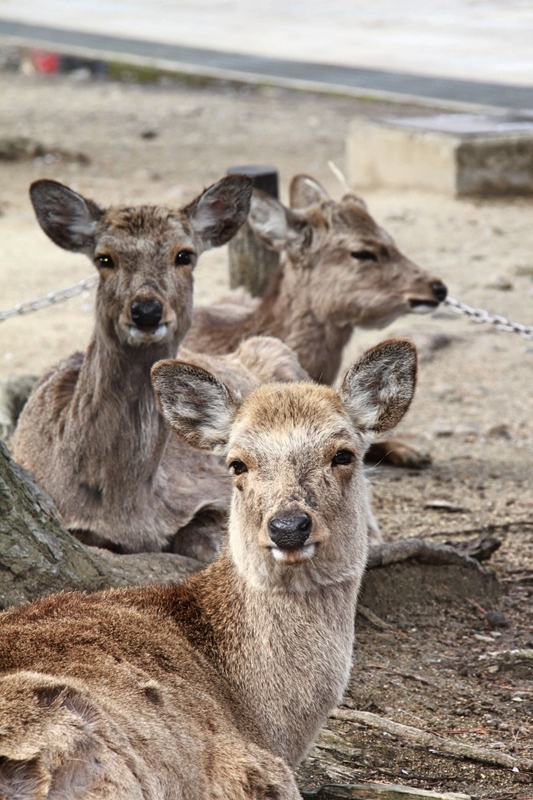 The deer are considered sacred by the locals and are given the freedom to roam as they see fit. 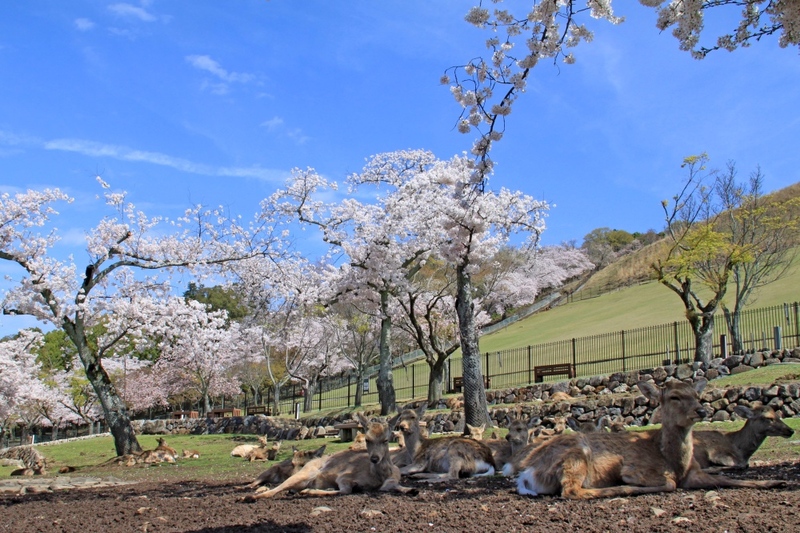 They are one of the main reasons that people visit Nara. The locals love them and the tourists adore them; they are pretty much the luckiest deer in the world, and they know it! Completely tame, they are not worried about anyone. They will approach you and let you pat them. But mainly what they want you to do is feed them! 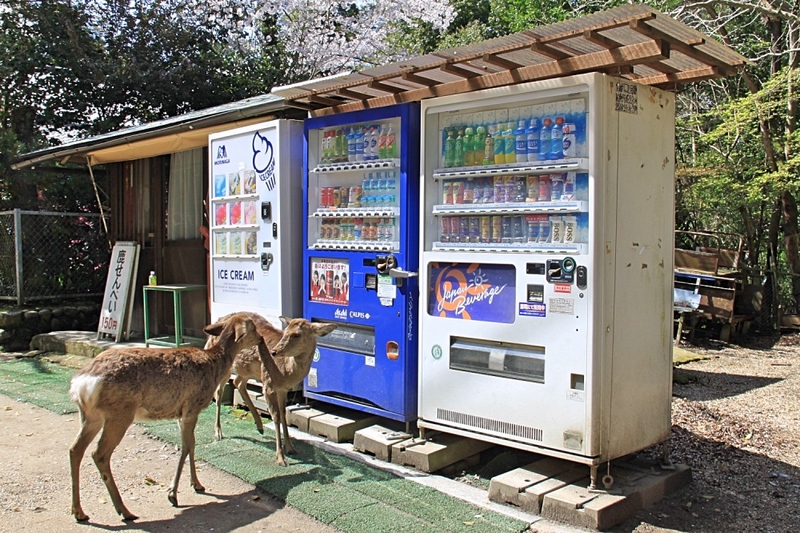 One of the biggest businesses in Nara is selling deer crackers! You can buy them pretty much anywhere in Nara for about Y150. The crackers are made especially for the deer, and as soon as they see you with them in your hand you become their best buddy! Is it a good idea to feed them? That’s a different story! They have become so accustomed to being fed by tourists that they can become a bit pushy at times and might even try to nudge you gently for food or steal crackers or maps out of your pockets! They are pretty cute though and it is really hard to draw yourself away from them to go and see the temples! 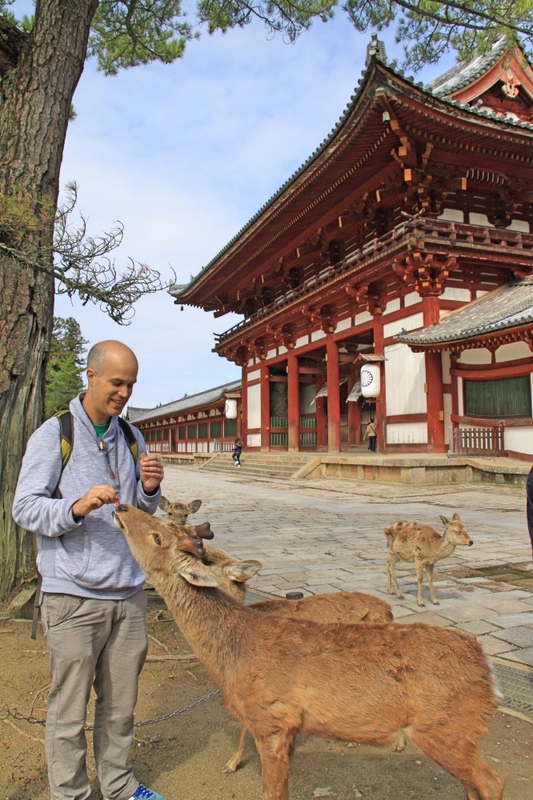 When you finally manage to walk away from the deer, head to the Todai-ji Temple. 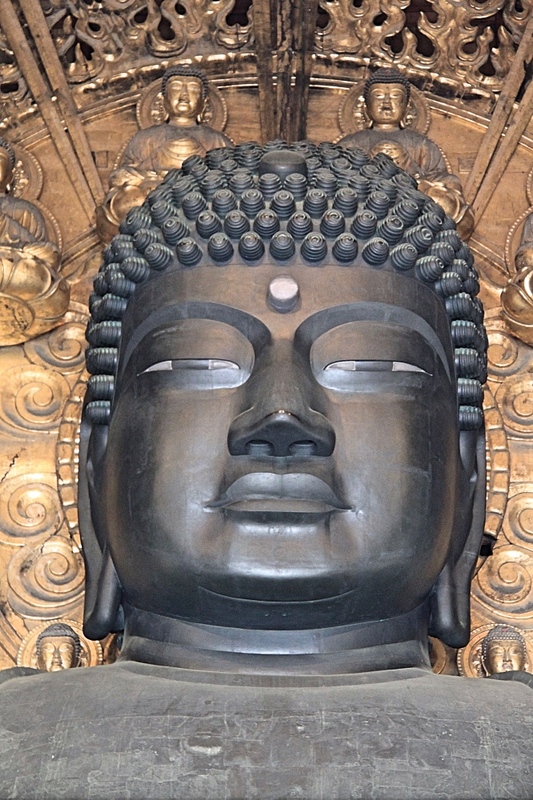 Its main hall, the Daibutsu-den, houses the biggest indoor Buddha in Japan. Made of bronze the statue weighs five hundred tons and is sixteen meters tall. It is a real masterpiece and you will be in awe of its size. 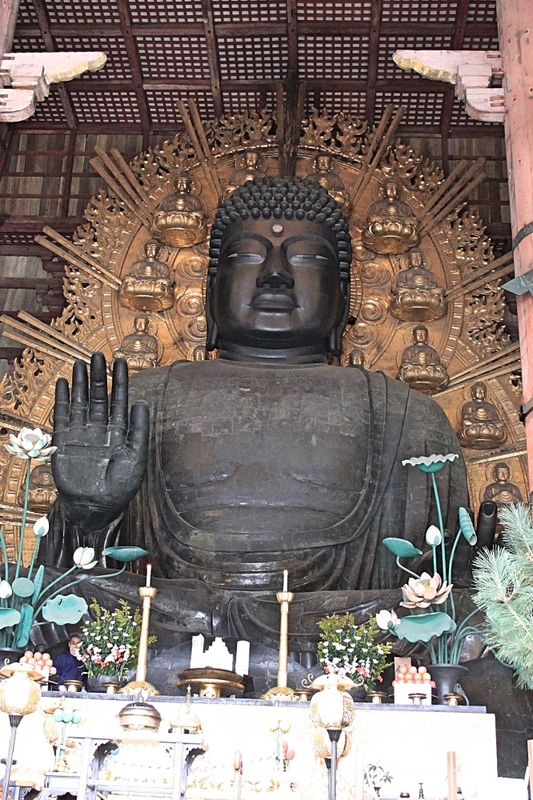 The Great Buddha of the Todai-ji Temple. 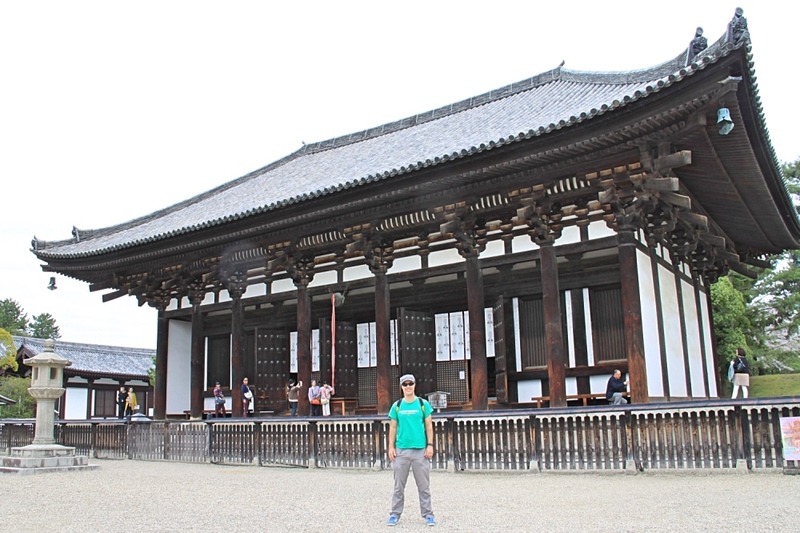 The Todai-ji temple is equally impressive and is now listed as a UNESCO World Heritage site. 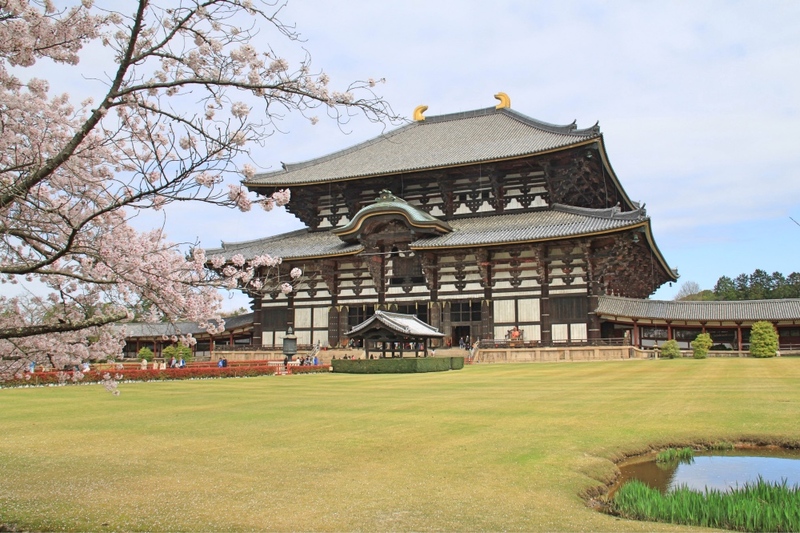 The Daibutsu-den is the world’s largest wooden structure and I guess it needs to be to house such a massive statue. 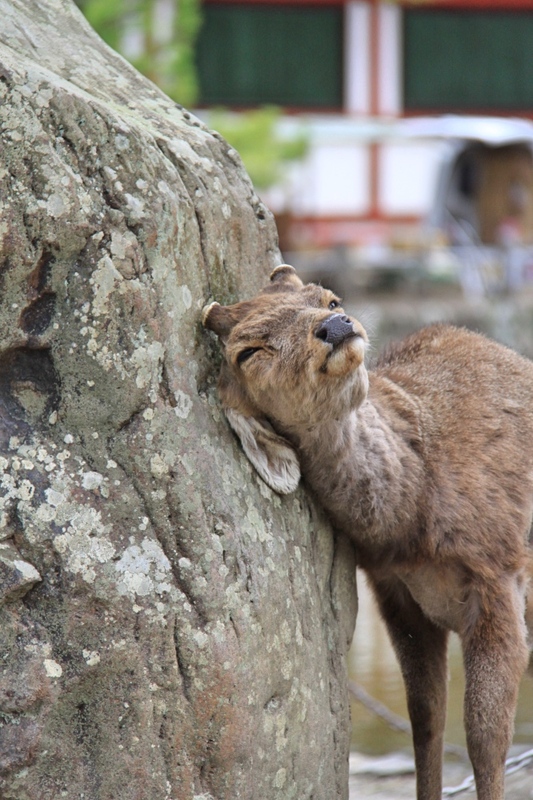 If you miss the deer already then don’t worry; many of them hang around Todai-ji. Why wouldn’t they? Todai-ji means tourists. Tourists mean deer crackers! Hanging by the Todai-ji temple! 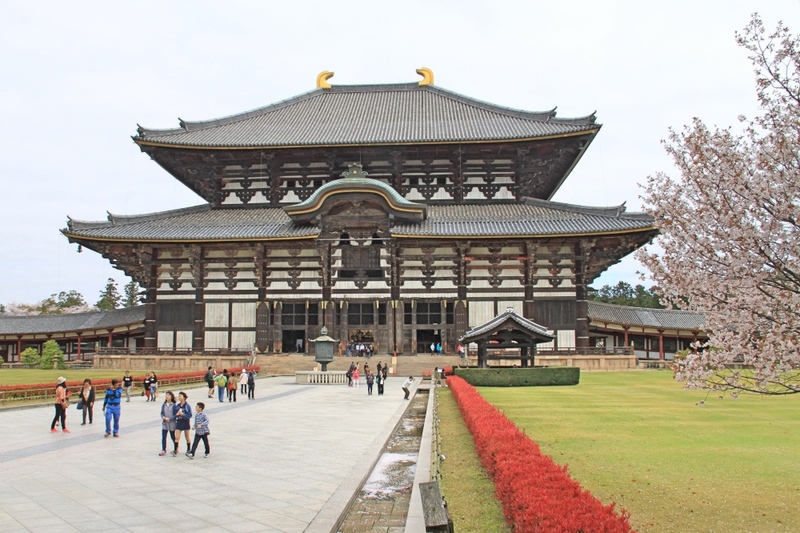 Kofuku-ji Temple is Nara’s second greatest temple. 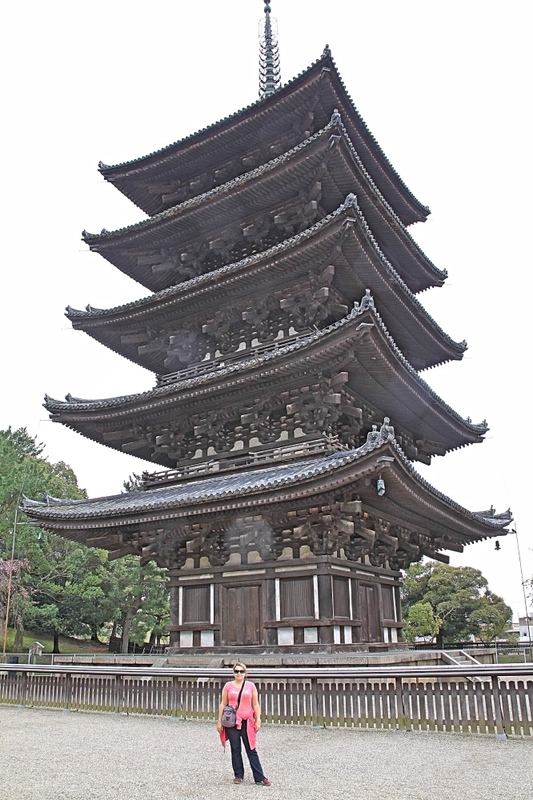 Its five-storey pagoda is Japan’s second tallest and is a landmark of Nara. Kofuku-ji is pretty impressive and worth a visit. The five storey Kofuku-ji pagoda. 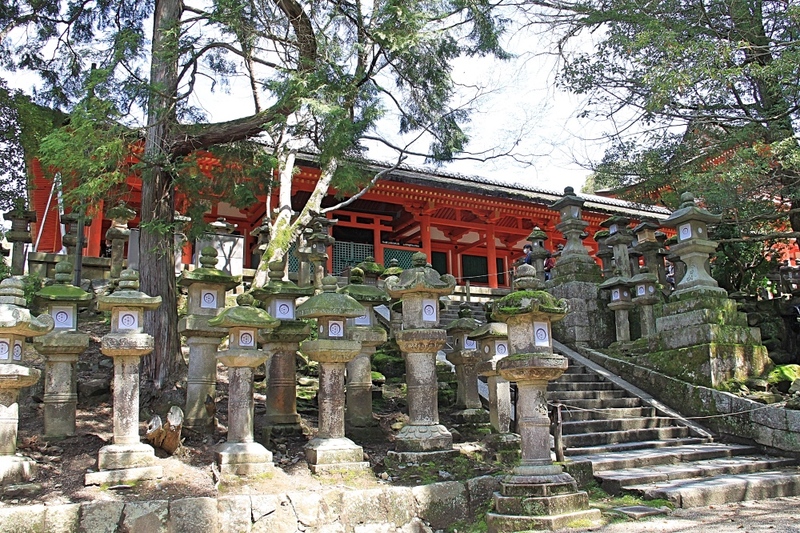 Nigatsu-do temple is just a short walk away from Todaiji. It is however a lot less crowded. 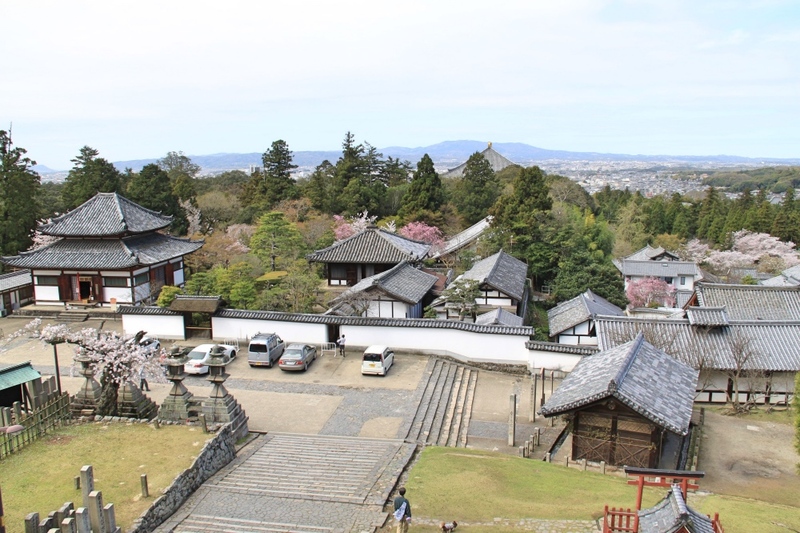 The walk up is amazing (especially during cherry blossom season) and the wooden temple has a great balcony overlooking tree tops, roofs, hills and with stunning views over the city of Nara. We loved walking around the grounds to soak in the peaceful and zen-like atmosphere and checking out the Japanese architecture. 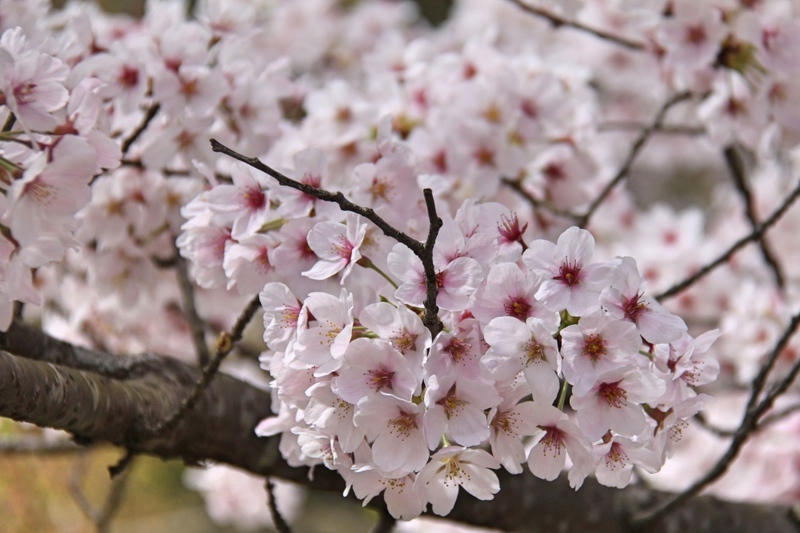 Some cherry blossoms on the way to the Nigatsu-do temple. The view from the balcony of the Nigatsu-do temple. This shrine has one of the best settings in Nara. Its location within a hilly woodland makes it a very natural, peaceful and restful place. 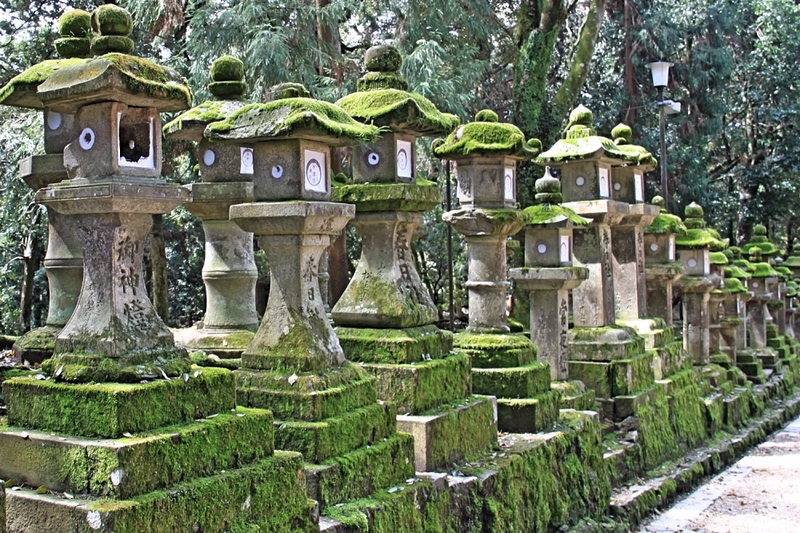 The long uphill path leading to the shrine is dotted with many stone lanterns. Those lanterns have different shapes and colours and provide an amazing subject for photography, especially when a deer decides to photobomb your shot! Walking down that path should not be missed! The lanterns leading to the temple. 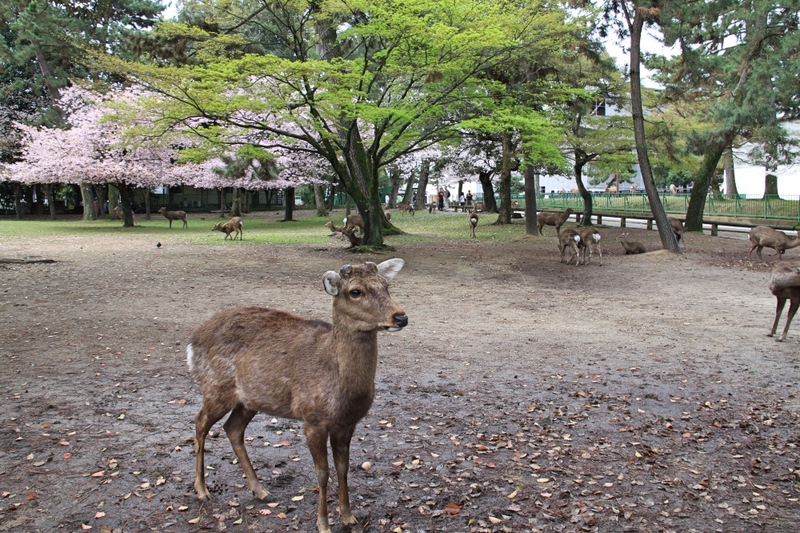 Nara-koen Park is the biggest park in Nara and it is beautifully maintained with very lush, green surroundings. 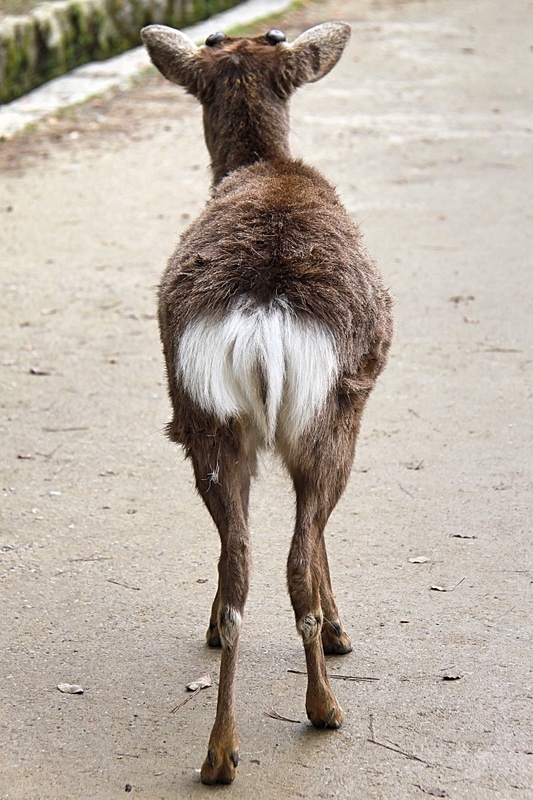 There are close to one thousand deer living in the park, so you will have no shortage of deer patting opportunities as you visit this vast park. It’s a great place to relax with a picnic or to rest after a few hours exploring temples. You won’t feel alone because even if you manage to find a tourist free zone, there will always be a deer or two to keep you company! Cherry blossom in the Nara-Koen Park with some friendly locals relaxing! A deer hanging around in the park! A young deer in the park. We had the best Tonkatsu we’ve ever had at Tonkatsu Ganko while in Nara. This restaurant is hidden on a pedestrian street in the city centre and is the place to go if you want to try this famous Japanese dish. So delicious! I wish we had spent more time in Nara so we could have eaten more of that gorgeous Tonkatsu! They have a menu in English so you know exactly what you are ordering. Bear in mind that even while hidden away it appears to be a very busy place so you might have to wait to get a table. The service was very fast however, so even without a booking and having to queue we didn’t wait long to get a table. 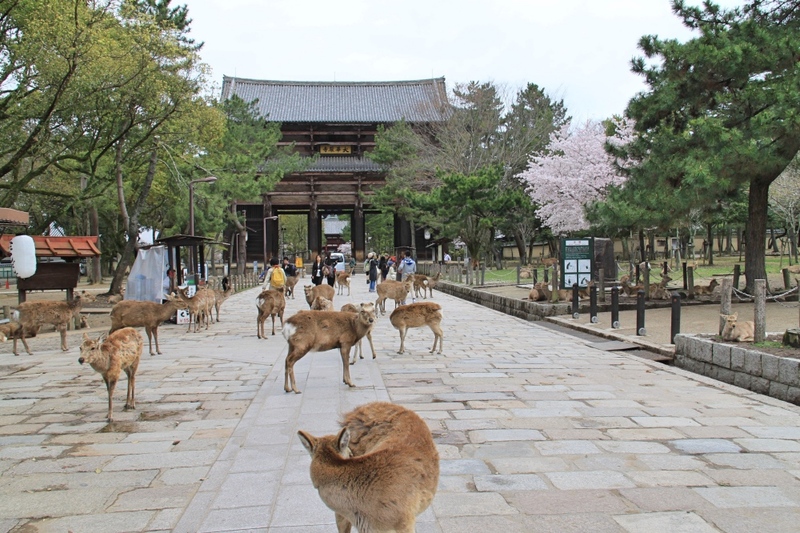 You can easily visit all of Nara’s main sites on a single day trip, but there is much more to see in Nara. Most of the sights are best seen by just wandering off the beaten path. If you can spare a night there then we would definitely recommend staying a bit longer. Nara was one of our favourite places in Japan. Spending the day wandering around was so relaxing and was a great way to experience the atmosphere of old Japan. The deer alone made it worth the detour! They were so amusing and certainly had a lot of character.